The comprehensive speed and precision that every multiaxis shop requires. The control you need for complex machining. With Mastercam, you have complete control over the three crucial elements of multiaxis machining: cut pattern, tool axis control, and collision avoidance. Support for today’s emerging profile tools for better finishes with shorter cycle times. Backplot, Verification, and Machine Simulation to check machine motion before it hits the shop floor— at the level needed for all stages of the 5-axis programming process. Deburr toolpath for automated deburring. 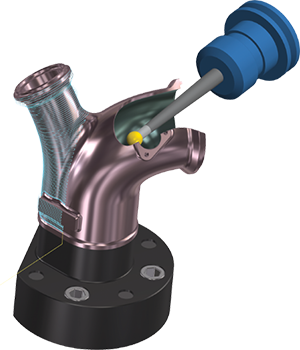 Advanced CAD for CAM tools that play an integral part in operation-specific model prep and geometry creation. Feature selection for 5-axis drilling — no Wireframe/work planes needed to drill off-axis holes. Multiaxis roughing to get in those hard to reach areas and remove material efficiently in simultaneous 5-axis. Advanced collision checking and linking that can be tuned for operation-specific needs. From basic 5-axis contours to Dynamic roughing and complex finishing, Mastercam is built to streamline multiaxis programming. Beyond the extensive, leading-edge features for precision and efficiency, what we do best at Mastercam is create code to drive your CNC equipment. You cut parts, not pixels, and our toothpaths help your machines achieve a reliable, efficient, smooth, and accurate motion. Part quality, extended tool life, repeatability ­— even the longevity of your machines — are directly related to this motion, and our customer support network is second-to-none. 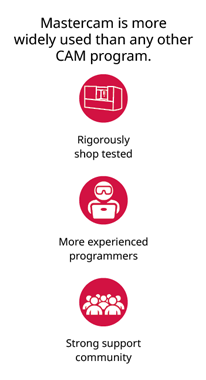 For more than 35 years, Mastercam has helped our customers outperform expectations.